The surprise of Coggeshall, a small and attractive town - imagine Great Bardfield or Wethersfield if they were much bigger, and ordinary people lived in them. In the heart of town, just off the high street is the parish church. Open. The use of the dedication, 'St Peter in Chains', suggests a High Church enthusiasm, and that is absolutely right. 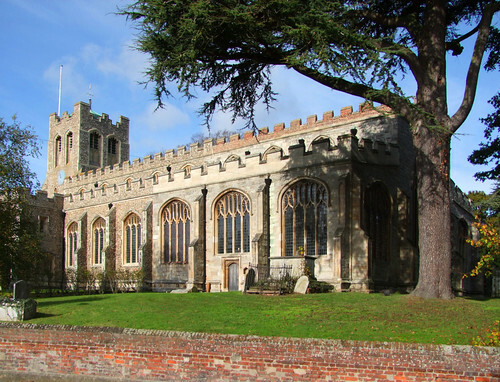 This is a big, super church, my favourite big church in Essex so far after Thaxted. Full of light, full of colour. An aesthetic pleasure, although the Leonard Evetts windows I had looked forward to seeing were almost impossible to photograph, as they are in the north aisle and the building was so very full of light.